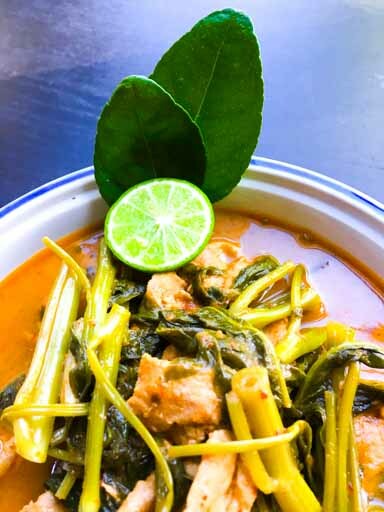 Chinese Water Spinach Curry has all the classic Thai flavors; salty, sweet, sour and hot. This dish, now made with pork, was originally made with a large, oily freshwater fish, known to the locals as "Tay Po'. At some point, the fish was replaced with pork belly. Then, as people are got more health conscious, the pork became leaner. But all the flavors are still amazing. 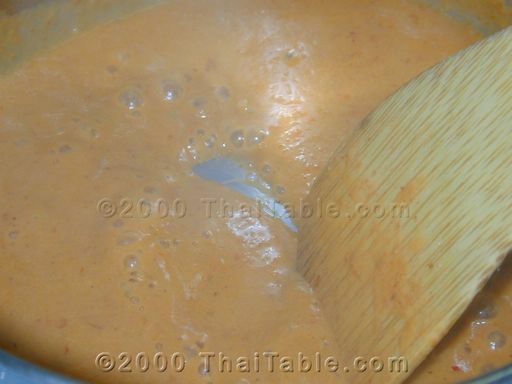 'Gang Tay Po' is a type of red curry called gang kua. Two of the characteristics of gang kua are the added sweet and sour. Sugar or palm sugar is the sweet. Tamarind or kaffir lime juice is the sour. 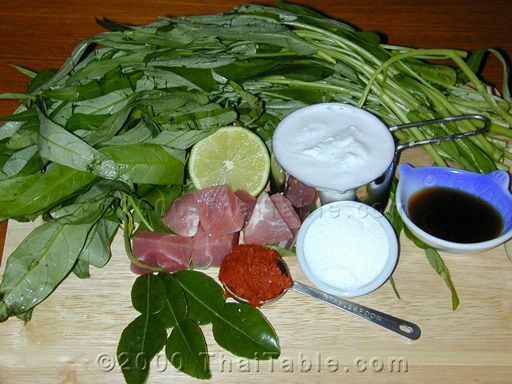 In Thailand, the water spinach that we use is grown in water and has larger stems and less leaves. But the Chinese water spinach that you find in the Asian market is a fine substitution. If you can find kaffir lime, use kaffir lime (the lime itself, not the leaves) instead of lime. It is tough to find a kaffir lime in the US. So, I substitute lime or lemon. In the good old days, pork belly was used but today, being health conscious, I recommend lean pork. 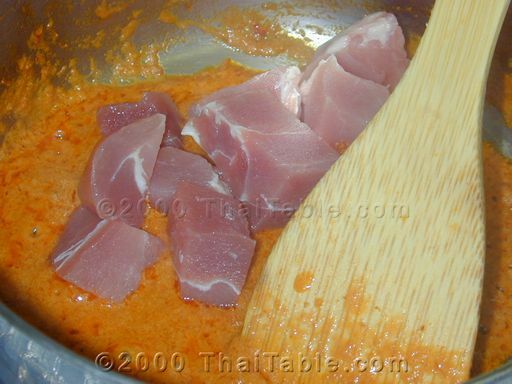 If you cannot find basic red curry paste or 'prig gang kua' substitute red curry paste for it. Cut the pork into bite size, 1/2 inch, cubes. Cut the Chinese water spinach into inch long pieces. In a 2 quart pot at medium to low heat, add half the coconut milk and the curry paste. Stir constantly to prevent the bottom from sticking and burning. You should see red oil bubbling up after 5 minutes or so. Be patient, don't turn up the heat. 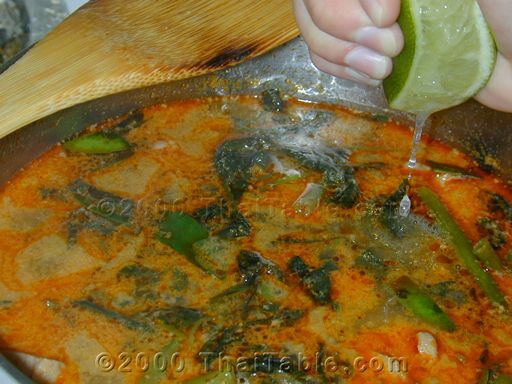 Your curry and coconut mix will soon enough sizzle and splatter all over your stove top. 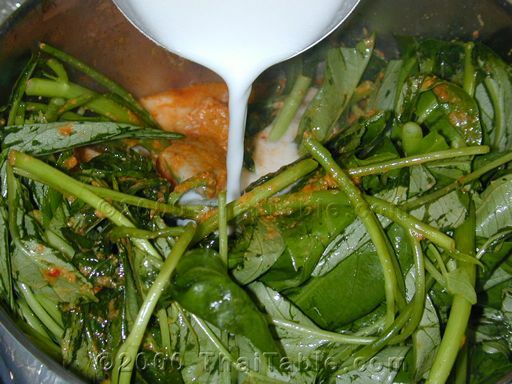 Quickly add pork and Chinese water spinach and stir so that you coat the pork and the Chinese water spinach. Then add the rest of coconut milk and water and bring up to a simmer. Add the sugar and fish sauce. Take all seeds out from the lime and squeeze the juice into the mixture. Drop the squeezed lime in. 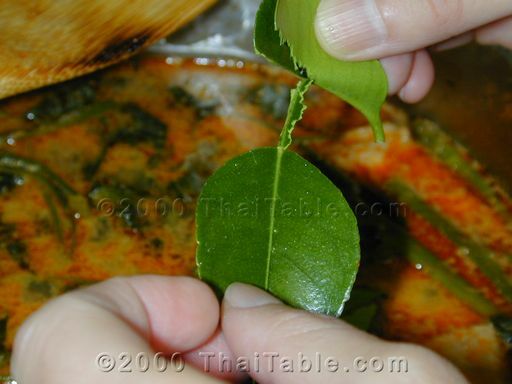 Break the kaffir lime leaves and add to the curry. Stir and let boil. This is a dish where the balance of the fish sauce, the lime and the sugar is important. Taste and add more fish sauce, sugar or lime if needed. It should taste a little bit sweet with a hint of fish sauce and lime. The dish tastes better if simmered for 1/2 hour. It tastes even better if you then let it sit overnight. Serve hot with rice.